Why Must Companies Call Their Products Extreme? Energy mints are nothing new, even before products with Taurine and Guarana became big business, there were mints that had caffeine such as Penguin mints that have been around for the last decade. 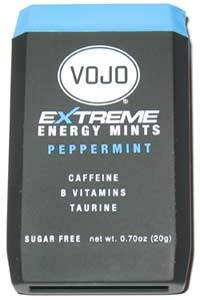 Just take one look around thinkgeek.com and you will find a huge line of mints that contain caffeine so when I was at the Walmart checkout line and I saw VOJO Extreme Energy mints I wondered what was so extreme about them. After trying them they are not a bad product even if I think they are a little expensive at $1.50 for about 40 mints but I do not see what is so extreme about them. I have a problem with products that have extreme in their name or slogan. They are hardly ever "extreme". If you are going to market something as extreme it has to be different or unusual, there has to be something that clearly differentiates it from all other products on the market. A few years ago I saw extreme white bread for sale at a local store, I wish I took pictures to prove that at one point a company was trying to actually sell white bread as an extreme product, what could possibly so extreme as a common staple of modern life such as sliced white bread? * "extreme." Dictionary.com Unabridged (v 1.1). Random House, Inc. 28 Jun. 2008. <Dictionary.com http://dictionary.reference.com/browse/extreme>. I bought my first Gerber knife during the summer of 1998. The knife was inexpensive and worked well for many years so when I was looking for a new work knife I thought I would get a Gerber knife. I was looking for a lightweight knife with a side clip. I found out Gerber knives made today are cheap, not inexpensive, just cheap both in price and in quality. I bought a couple new Gerber knives and neither one was nearly as good as the one I bought a few years earlier. The new knives were used almost everyday and had to be sharpened almost every week. Even a cheap knife sold at the price these are should be able to hold an edge for a little longer than a week. The only two good things about the current line of Gerber knives are they are lightweight and they are cheap enough that you can use it as a work knife and if it is lost or broken, you are not out much money. MRE stands for 'Meal Ready to Eat'. The military has been using the current MREs since the 1970's to feed hungry troops in the field. MREs are able to last for years (at least ten years) and can been eaten hot or if needed cold. MREs do not contain freeze dried food but rather individually sealed retort packaging of ready to eat food. The retort packaging is made of aluminum foil wrapped in plastic. The Each MRE contains a heating element made of magnesium which when mixed with water is able to heat the food packets that should served hot. 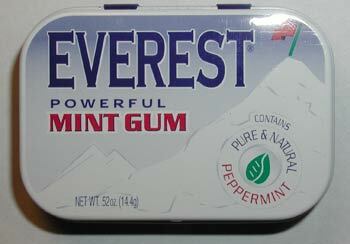 Everest Powerful mint gum is as advertised. The gum contains a very powerful mint flavor using peppermint oil and wintergreen oil (depending on whether you buy the peppermint or wintergreen variants). The mint favor is a little strange and is not your typical mint flavor gum you would expect to taste from other gums. The mint flavor is very strong and does not loose flavor very quickly. What is the cheapest digital camera you can buy and how good could it be? The cheapest camera I could find is a 100k Pixel (0.1 megapixels, 352 x 288) digital camera sold under several brands including the Philips Key chain Digital Camera Item model number: P44417S, Philips USA J44417 Keychain Digital Camera, VUPOINT DC-M10B2-VP Key chain Digital Camera, Bell+Howell Mini Digital Camera, Innovage Outdoor Sports Mini Digital Camera Model 1507651 and Q-See QS513K VGA Mini Digital Camera with Keychain. The camera comes with 2MB of dynamic ram that is able to take 20 pictures. Because the memory is dynamic rather than static, unlike more expensive cameras if the battery dies you will loose all your pictures. The camera is very small, 2.4" x 1.6" x 0.7" and only 2.4oz without the battery. The camera is also able to function as a web cam. The camera is under $15 and can be found for under $10.